For the very first time, Geneva is linked in a two-way broadcast with New York, where the live transmission of the GPHG ceremony is held at Tourneau's 510 Madison store. 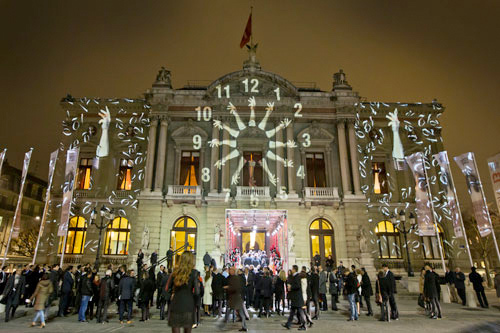 The Grand Prix d'Horlogerie de Geneva (GPHG) brings together some of the most influential figures in the industry, coming from around the world to attend the ceremony. Marcel Philippe, collector and the Assistant District Attorney for New York City, will be a special guest of Tourneau New York and a strong presence for the transmission to Geneva. He is the only United States representative serving on the GPHG jury. The ceremony, which is closely followed by enthusiasts abroad, is also broadcasting live for watch lovers in the United States via Tourneau.com. Created in 2001, GPHG has become the "Oscars" of the watch industry and is intended to salute the excellence of worldwide horological production, and annually rewards the finest creations and the most important figures in the watchmaking world. It thereby contributes to promoting horology and its prime values that are shared by the Banque Privée Edmond de Rothschild, the main partner of the GPHG Foundation. The trophy of the Geneva Watchmaking Grand Prix, the hand, is the symbol of skill and mastery, both key to all watchmaking trades. The inspiration for the trophy came from the fresco on the ceiling of the Sistine Chapel, painted by Michelangelo. It also symbolizes the memory and the passing on of knowledge. The competing watch categories are as follows: Ladies', Men's, "Aiguille d'Or", Innovation, Jewelry & Artistic Crafts, Best Complicated, Sports, "La Petite Aiguille", and a Public Prize. - The best overall watch among all categories. It is the most prestigious distinction. - A horological creation featuring the most innovative research on a conceptual level. - An exceptional master of one or several of the following techniques: gem-setting, enameling, engraving, lacquering, and open-working. - A watch featuring at least one of the major complications: complete calendar, perpetual calendar, striking mechanism, tourbillon, split-second chronograph. The jury may choose to broaden this category to possible new complications presented in the competition. - A watch designed for the measurement or practice of sport, which is at least water-resistant (ISO standard 2281) and shock-resistant (ISO standard 1413). - This prize rewards a watch with a retail price of under 7,500 Swiss francs (close to 7,914 US dollars). - This prize is awarded based on public votes as expressed during the exhibitions preceding the Geneva Watchmaking Grand Prix ceremony or from the GPHG website and partner sites.